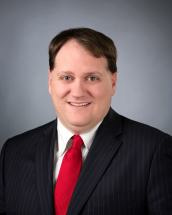 Kevin J. O'Keefe joined the Firm in 2018 as an associate after spending five years in New Jersey practicing personal injury, insurance defense, and municipal prosecution, and two years in Dodge City Kansas as an Assistant Ford County Attorney where he received a federal grant to attend intense trial advocating training at the National Advocacy Center in Columbia South Carolina. While Mr. O'Keefe has handled a variety of cases, he specializes in personal injury. Mr. O'Keefe obtained his Bachelor of Arts from Rutgers University in 2005 with an emphasis in political science and history. While in Law School he clerked for the Shawnee County District Court in Topeka Kansas. After obtaining his Juris Doctor from Washburn University with Deans Honors in 2008, he became an Assistant Ford County Attorney where, over the next two years, he gained significant trial experience. In 2013, Mr. O'Keefe entered private practice. He is currently a member of Nebraska and New Jersey State Bar Associations. He is admitted to practice law in Nebraska, Kansas, Ohio and New Jersey.